Didden Doors pack changes the usual doors in Minecraft Pocket Edition so that no one will see them. The purpose of this resource pack is the creation of secret or hidden at home, shelter, treasure or something that only you can imagine. But the problem lies in the fact that the updated doors have a new texture only those players who have installed the texture pack. So if you want your friends can not see the doors, then add this pack in some other generally mask it. How to use the hidden doors. 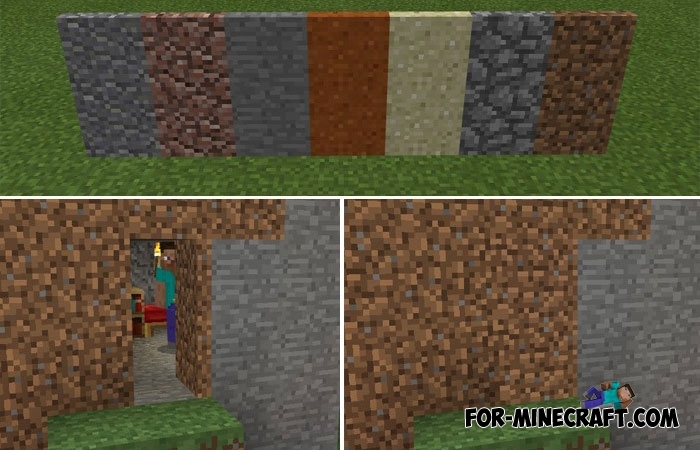 There are seven doors in Minecraft PE, and they will be replaced by the hidden. Crafting recipe remains the same, do not worry it works in both survival and in creative modes. Select the door depending on the surrounding blocks. That is, if you have built a house of stone then put the stone door. There are hatches except doors (only the stone and dirt). Do not forget that the resource pack does not work in multiplayer until all players have to install it. And yeah, you will not see the differences between the door and the block, so it is advisable to put some mark to quickly find the front door or hatch.